This album has been in my collection for some time but it seemed appropriate to review it now because we are carrying a review of a new book on the composer and Music on the Web is also carrying reviews of more music by Honegger this month. 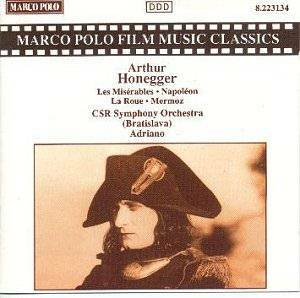 Arthur Honegger (1892-1955), one of the greatest of twentieth century composers, made a very significant contribution to film music during the course of some 30 years from his scores for Abel Gance's La Roue in 1922 and Napoléon in 1926, to his last work in the genre in 1951. He scored for a total of forty films. Honegger arranged some of his film music for the concert hall. Probably his most famous work, Pacific 231 (the name of a locomotive - he was passionately interested in railways, including model railways) was originally composed as a concert piece but was later used in a film about the train. Les Misérables begins with the sombre 'Générique', intense and dramatic almost a funeral march but it soon develops into a lighter veined and appealing pastoral accompaniment for Jean Valjean on his travels. 'Dans les Égouts' (In the sewers) is another dark expression of superhuman effort and is based on a continuous rhythm of pairs of eighth-notes. 'Music chez Gillenormand', using an ensemble of string octet and solo wind, recreates the chamber character of this contrastingly cheerful rollicking piece. Clarinet and trumpet play a picturesque duet in this charming interlude. 'La mort de Valjean' (The Death of Valjean) is a lovely deeply-felt cue employing trumpet and saxophone in the melodic line, with a continually modulating two chord ostinato figure passing from piano to strings. The final L'émeute (The riot) is epic battle music. La Roue (The Wheel) is something of a misassembly of scraps of material from the music Honegger wrote for Abel Gance's film. As one might deduce from the short piece's rhythmic patterns, the film is about railways and the melodramatic material suggests dirty doings afoot(plate). Much more significant and impressive is Honegger's splendid music for Mermoz (1942). It is one of the best scores Honegger wrote for the cinema. The film was about the French aviator Jean Mermoz. It is interesting to compare this score with that of Franz Waxman's for Billy Wilder's marvelous The Spirit of St Louis for there is a commonality between the two screenplays. The suite is in two movements: La Traversée des Andes (Crossing the Andes) and Le Vol sur l'Atlantique (The Flight over the Atlantic). The music is vividly evocative. You can visualise the swirling of the air around the aircraft and its progress through the clouds over the Andes and the lightning flashes around the little plane as it gropes its way through the storm over the Atalantic. This is imaginative evocative writing at its very best. I would commend every student of film music to listen to this work. Honegger's Suite from Napoléon consists of very varied material. The opening 'Calme' is an idyll in the style of the composer's highly popular Pastorale d'été. 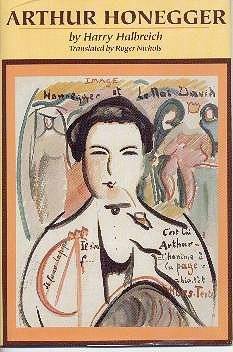 'La Romance de Violine' is romantic pastiche; a salon piece. 'Danse des Enfants' is a buoyant folksong-like trifle in the manner of Messager. The tone changes in 'Interlude and Finale' which starts out sounding darkly impressionistic before revolutionary songs intrude. The 'Chaconne de L'Impératrice' is more of a slow rather sultry waltz that nods towards Fauré or Messager. 'Napoléon' sounds appropriately imposing, indomitable and regal. Adriano makes much more of 'Les Ombres' (The shadows) than Marius Constant on a rival Erato Ultima CD. This is a mysterious and atmospheric piece for strings and mid-distanced trumpet suggesting the call of duty before an approaching storm. The final 'Les Mendiants de la Gloire' (The Beggars of Glory) brings the suite and the album to a magnificent and glorious conclusion as Napoleon's army marches off to Italy to La Marseillese in a peroration that rivals that of Tchaikovsky's 1812.